Propeller guard is made out of a light weight but strong, high impact, flexible injection molded plastic. In addition to protect, it controlls water flow which gives the boat improved handling and more power. Dimensions: Propeller diameter 8,5” (21,59 cm). For engines 10 – 20 HP. Colour: Yellow. Propeller guard is made out of a light weight but strong, high impact, flexible injection molded plastic. In addition to protect, it controlls water flow which gives the boat improved handling and more power. Dimensions: Propeller diameter 10,5” (26,67 cm). For engines 25 – 35 HP. Colour: Orange. 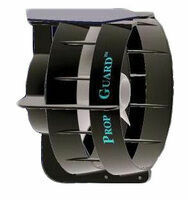 Propeller guard is made out of a light weight but strong, high impact, flexible injection molded plastic. In addition to protect, it controlls water flow which gives the boat improved handling and more power. Dimensions: Propeller diameter 12,5” (31,75 cm). For engines 40 – 65 HP. Colour: Blue. Propeller guard is made out of a light weight but strong, high impact, flexible injection molded plastic. In addition to protect, it controlls water flow which gives the boat improved handling and more power. Dimensions: Propeller diameter 13,5” (34,29 cm). For engines 70 – 100 HP. Colour: Red. Propeller guard is made out of a light weight but strong, high impact, flexible injection molded plastic. In addition to protect, it controlls water flow which gives the boat improved handling and more power. Dimensions: Propeller diameter 15,5” (39,37 cm). For engines 110 – 350 HP. Colour: Black. Bracket for auxiliary engine, made of mirror polished stainless steel. Drop-down system with intermediate adjustment with a comfortable handle. Brackets are fitted with the latest high-resistant boards. 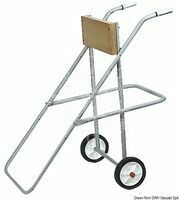 Up to 8 HP or 30 kg, Base: 110 x 150 mm. Board: 190 x 260 mm. Bracket for auxiliary engine, made of polished stainless steel, mirror polished, with high resistance plastic board. Adjustable handle. Up to 15 HP or 40 kg, Base: 140 x 150 mm, Board: 190 x 260 mm. 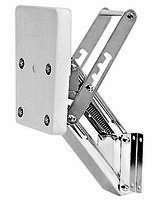 Bracket for auxiliary engine, made of polished stainless steel, mirror polished, with high resistance plastic board. Up to 20 HP or 45 kg, Base: 140 x 150, Board: 250 x 260 mm. Bracket for auxiliary engine, made of polished stainless steel, mirror polished, with high resistance plastic board. Up to max 7 HP or 25 kg. Fixing board: 110 x 140 mm. 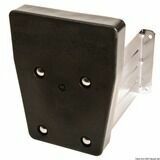 Heavy duty engine support for wall mounting. Can support engines up to 45 horsepower. Extension handle for outboard motors with release lock. Made of anodized light alloy with rubber grip and nylon locking. Suitable for all outboard engines. Length: 60 cm. Telescopic extension handle for outboard motors with snap shut system. Lenght: 61-100 cm. Fitted with wheels and 22 mm zinc plated steel tank bracket, evaporated beech polyurethane lacquered board. For engines 2T up to 35 HP or 4T up to 15 HP. Fitted with wheels and zinc plated steel tank bracket, evaporated beech polyurethane lacquered board. For engines 2T up to 60 HP or 4T up to 40 HP. 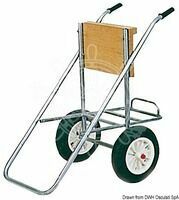 Fitted with nylon and rubber wheels, includes a tank-holder; equipped with a special locking system, foldable carrier, takes up little space; made of zinc chrome; polyurethane lacquered phenolic plywood board. For engines 2T up to 150 HP or 4T up to 115 HP. Stern protection made from heavy-duty plastic. Dimensions: 230 x 85 mm. Stern protection made from heavy-duty plastic. Dimensions: 270 x 100 mm. Stern protection made from heavy-duty plastic. Dimensions: 300 x 220 mm. Stern protection made from heavy-duty plastic. Dimensions: 430 x 350 mm. Stern protection made from heavy-duty plastic. Dimensions: 420 x 340 mm. Made of aluminium, fitted with motor-protection safety ring. 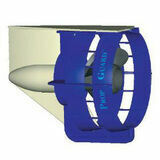 Dimensions: 200 x 94 mm (up to 10 HP). Made of aluminium, fitted with motor-protection safety ring. Dimensions: 316 x 100 mm (up to 10 HP).